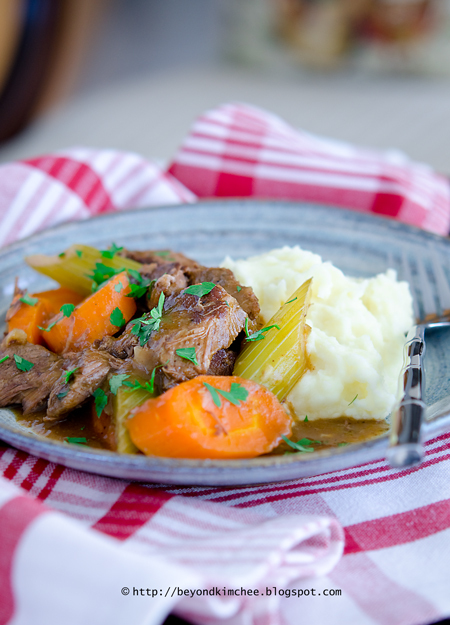 Everyone has their own way of making beef stew more flavorful. Yes, water with a couple of beef bouillon cubes for the intense beef flavor. 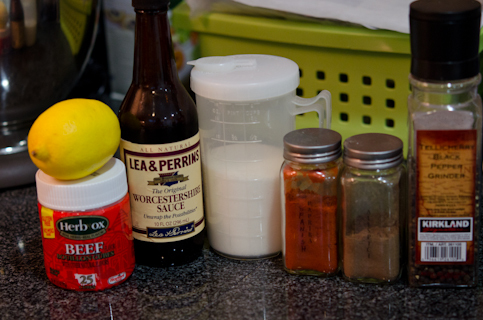 I like old fashioned beef stew with humble everyday ingredients. There are times that you just want nothing but plain old comfort food without sensationalizing your taste bud. 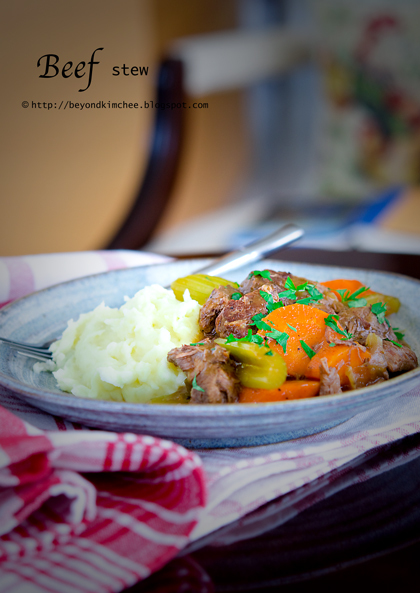 This beef stew works for me and for my family. The ingredients are something you might already have in your pantry and all you need is time to simmer. 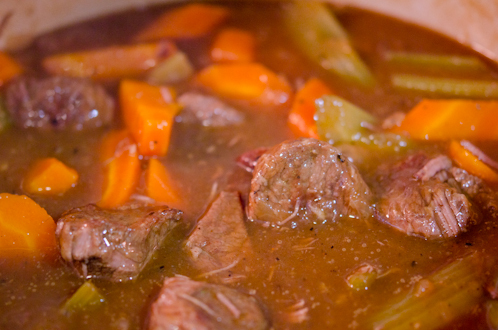 I add Paprika and a hint of allspice to make this beef stew the flavor of good old time. One thing I do differently is that I don’t add chunks of potatoes in the stew. I like to eat my stew with creamy mashed potato on the side to soak up all that delicious gravy. Make this stew ahead of time because it gets even better next day. 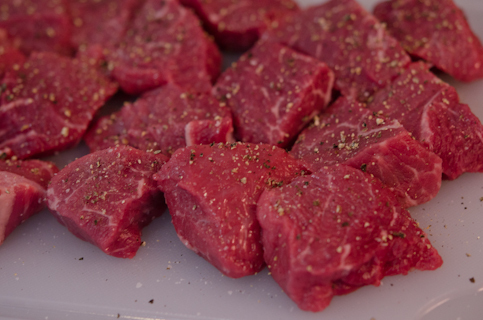 Season your beef with salt and pepper. You can coat with flour if you want but I usually skip that. 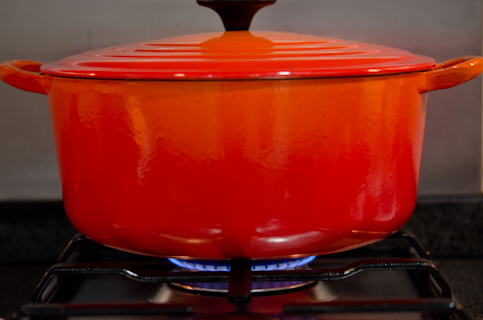 Now, place a good dutch/french oven on the stove. Brown your meat in hot oil. You might need this step in two or three batches. Set aside. Keep their juice. Add the onions to the pot and saute for 2 minutes. 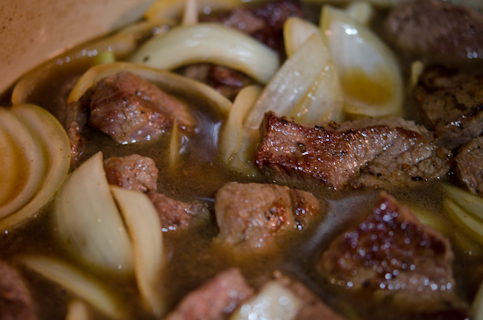 Pour water to just barely cover the beef and onion. 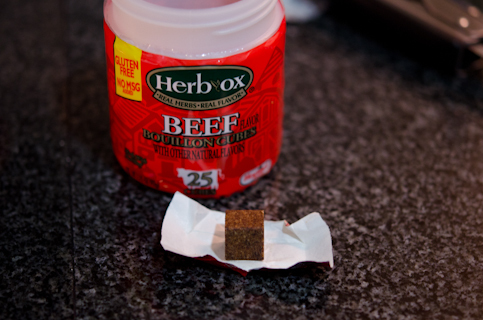 Peel off a couple of beef bouillon cubes and dump in the pot. These are my beef stew flavor crew. Add a bay leaf to the list. 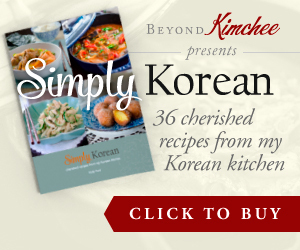 This poor Korean housewife can never ever pronounce the name of this important sauce right. Why do everyone say it differently? 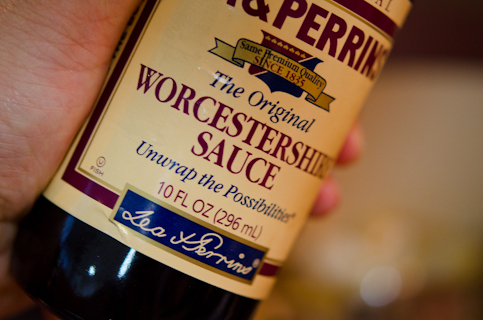 Anyway, you need to add 1 tablespoon of this “wooster” or “woochester” or “woshestershire” sauce. This is an optional. I like to add a little bit of lemon juice. 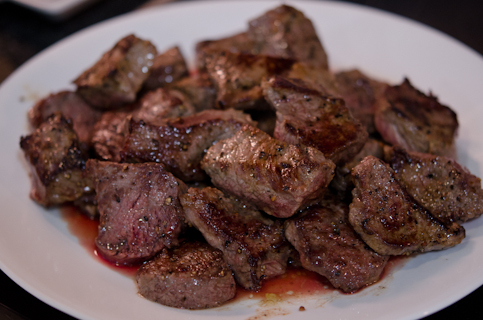 You won’t taste it but it will tenderized the meat dramatically if the cut is quite tough. Throw the other spice along with salt and pepper, and the bay leaf! Cover with a lid and let the whole thing simmer for 1 1/2 hours or so. Take the bay leaf out and add the carrots and celery. 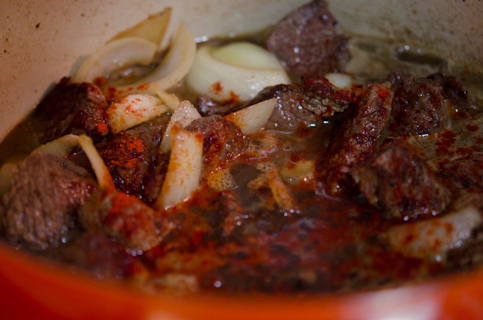 Put the lid back and simmer for another 30-40 minutes or until they are folk tender. 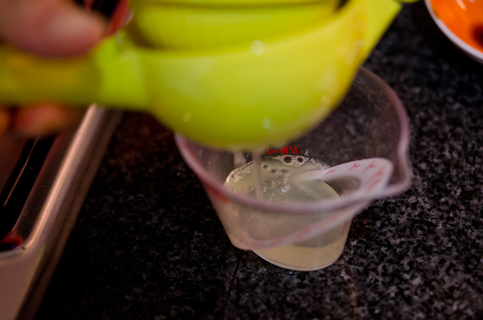 Mix cornstarch with water and pour over the stew, stir. It will take a few minutes to thicken. Here, the stew is finished. Oh, boy! This is a good stuff! 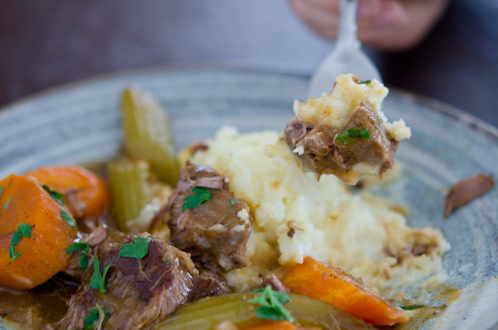 Serve the stew over your favorite mashed potato soaking up all that good gravy. 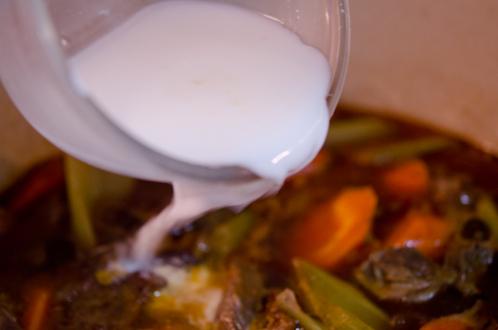 Warm comforting beef stew without breaking your bank account. Get yourself a nice tossed green salad and some corn bread to go with. Heat oil in a pot. 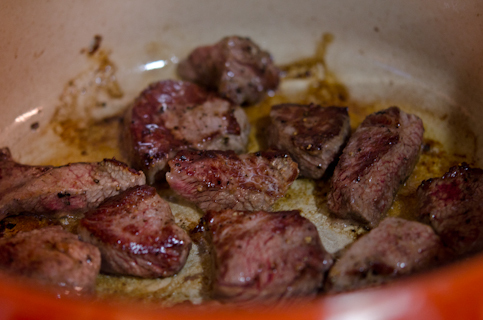 Season beef cuts with salt and pepper and brown them in a several batches. Remove from pot an set aside. 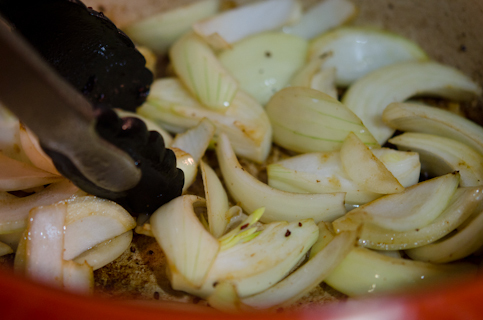 Saute onion for 2 minutes and add water, beef bouillon cubes, bay leaf Worcestershire sauce, salt, sugar, lemon juice, paprika, allspice, and pepper. 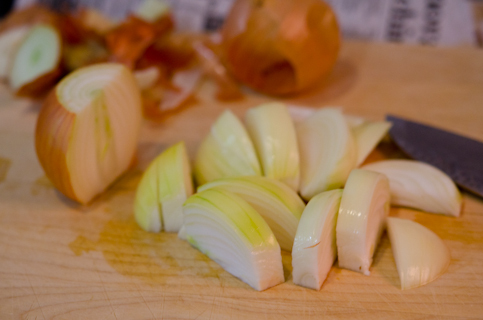 Cover with a lid and simmer for 1 ½ hour or longer if your cut is thick. 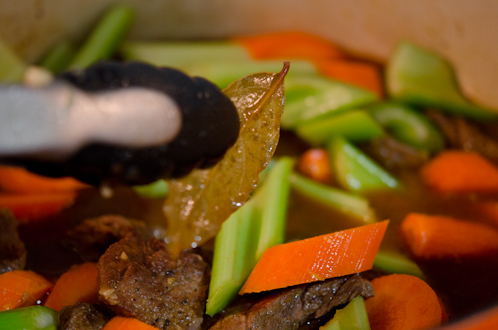 Take out the bay leaf, add carrots and celery, and simmer for another 30-40 minutes, covered. When the vegetables are folk tender, mix 1/3 cup water with 2 tablespoon cornstarch and add to the pot. Stir and cook until bubbly. Serve with your favorite mashed potatoes. To be honest, have not had any beef stew for a long time ! I think I can do this at home, thanks ! thanks for providing new dish for my husband.. thanks for sharing. MMMmmm! 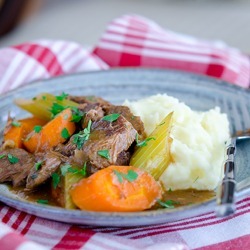 I love a good beef stew, this definately seems a good one for the boys! and the weather is so cold here in England, just what I need to warm up! Yes, you will. Sorry for the mistake. I meant to click the preview button as I was writing the post but ended up clicking the wrong one. I will post as soon as I finish writing up. Thank you. I bet is is very cold in England these days. Hope your boys would like the stew. Thank you. Yes, this is the basic classic stew that everyone can make and delicious. 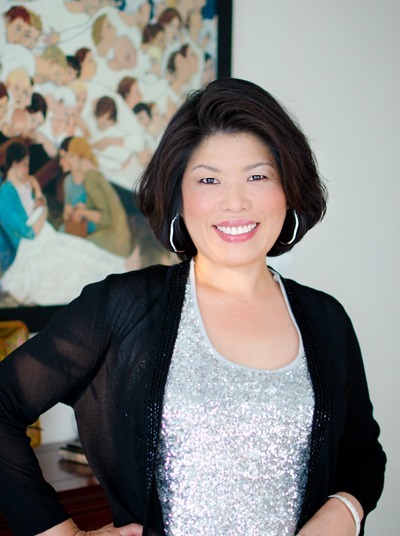 Hi Wong, Hope you can give this a try soon. Thanks. That looks really good, and really good for bodybuilding!!! Your recipe and pictures look inviting enough for me to try this out. Thanks. This looks good. And it is woostershire sauce! Definitely. I live in england! But this stew would make me happy, not cry. 超级喜欢哦，尽管刚刚吃过饭，我又感觉饿了，周末一定要尝试下。I like your food so much,I am hungry after eating breakfast in one hour.Haha,I will try it this weekend.Thanks for sharing! I am hungry! Any place where can I buy it? The pronunciation of Worchestershire is "woy-stuh-sheer"
I am doing this great recipe tonight once again. love it. thank you.